Accessories: Accompanied by autographed picture of Ayrton Senna, and autographed helmet faceguard, letter from Angelo Parrilla confirming the watch was gifted to him, photographs, original box, service guarantee, pouch, product literature. "A Angelo da Ayrton 1978” (to Angelo from Ayrton) these few words convert this elegant Rolex Daytona reference 16528 into a watch any motorsport petrol head could dream of. By 1990, Ayrton Senna da Silva had achieved every success in the pinnacle of motorsport. Crowned Formula One World Champion in 1990, following his move to McLaren in 1988, he had tasted major success as well as being labelled one, if not the greatest, talents of his generation. And yet he also had to come to terms with the less pleasant sides of Formula One, the politics following the loss of the title to his team mate in Japan the season previous, the torment of whether to leave the sport he harboured such a huge passion for and finally the reality of the dangers of his profession following Martin Donnelly’s accidents in testing at Jerez. He was scared, reflective, but determined to pursue his desire to be the best. It was during one of these reflective moments that Ayrton Senna was asked who was the greatest driver he raced against? He gave the simple answer of a team mate he raced in Karting, when racing was about pure driving pleasure with no politics and no money involved. Racing was his passion and karting was the sport that enabled Senna to reach the iconic status that he still enjoys today, over 20 years following his untimely death, as one of the world's greatest F1 drivers. The present outstanding early floating dial Daytona reference 16528 is a tribute to the man who helped shape Senna’s career from the start as attested by the message engraved on the caseback: “A Angelo da Ayrton 1978”. Its recipient was Angelo Parrilla, a legend in Karting and the founder of DAP who “discovered” and brought Senna to Italy by establishing a relationship with the then 18-year-old that went far beyond the sporting association. Quite simply Parrilla was an early mentor for arguably the greatest Formula One driver of all time and this yellow gold Daytona symbolises the appreciation for the memories that kept Senna strong during his darkest days. Apart from all the emotion attached to this watch it is hard to overlook the features that make it stand out on its own. One could contrast the gold, yellow, with the colour that adorned Senna’s helmet during his lifetime. 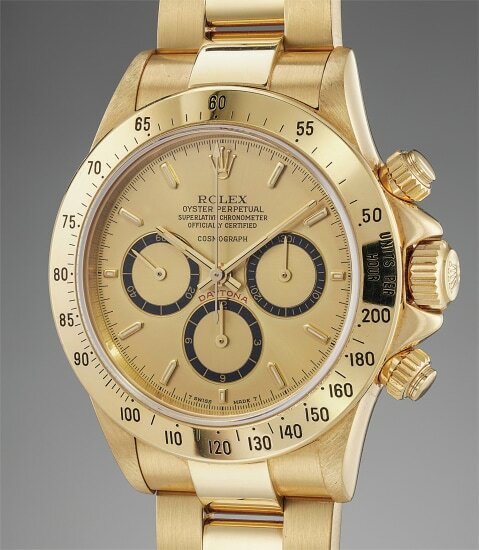 Furthermore, this R series 16528, the earliest iteration of Rolex’s first automatic gold chronograph Daytona, is fitted with the desirable and rare floating dial and Mark 1 bezel prized by collectors. The present watch is not only offered in superb condition but comes with a series of accessories making it a must have for any Formula One fan including a signed faceguard of Senna’s driving helmet. This timepiece spans more than horology. It is part of a unique history between one of the most iconic watches in the world, the sport that the Daytona is synonymous for and one of its greatest ever drivers.